or: Why Do They Get To Stand In The Shade? 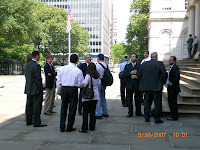 It was bright and sunny this morning at New York City's City Hall near the southern tip of Manhattan, when Councilmember Joel Rivera, Majority Leader of the New York City Council, together with AMCHA, the Coalition for Jewish Concerns, announced his intent to introduce a resolution calling on the Pension Boards of New York City and New York State to divest themselves of any investments made in corporations having ties to Iran's petroleum-energy sector. 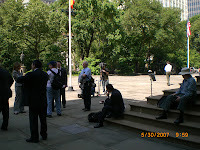 As the participating councilmembers and activists gathered and greeted each other, a podium was set up with sigillum civitatis novi eboraci — the seal of the City of New York — and a video camera was placed to record the press conference. 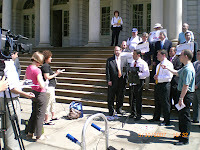 You can see attached to the podium a microphone from 1010WINS, an AM news radio station based in NYC. 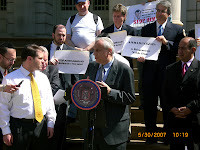 The press conference was introduced by Ari Hoffnung of the Riverdale Jewish Community Council, who then passed the speaker's place to Councilmember Rivera, who explained the background behind the resolution and the reasons it is needed. 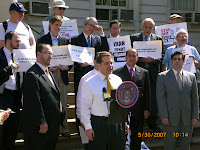 He explained that divesting from companies that invest in Iran is "an issue of national security," and that "New Yorkers should know that one billion dollars of their pension money has been invested" in Iran, a nation whose nuclear program is a threat to the United States, our fellow democracy Israel, and other countries around the world. He said that "action needs to take place now," and that introducing this resolution puts New York City in the company of the states of California, Missouri, Florida and Illinois, which are now working on or have already passed similar divestment resolutions. Rivera pointed out that similar divestment campaigns worked against the Apartheid regime in South Africa in the 1980's, and that they can work again. 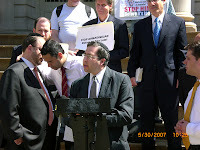 Rabbi Avi Weiss spoke about how "money talks," and strongly affirmed that the pressure being put on Iran is "of course not directed against the people of Iran," but only against Ahmadinejad, "the tyrant, the wicked president of Iran." Rabbi Bruce Ginsburg discussed recent instances of hostage-taking by the Iranian military, including the case of the British sailors taken from Iraqi territorial waters — an action that "they didn't pay a price for." 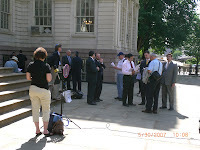 What made Councilmember Rivera, as well as other members of the City Council, take notice of Iran in this way was ultimately the MASS RABBINIC ARREST civil disobedience protest; unfortunately, not all of the participating rabbis were able to make it to this press conference. While there weren't that many people actually participating in the press conference, the resolution has wide support in local government — a number of politicians sent aides to represent them, each of whom were identified as well. 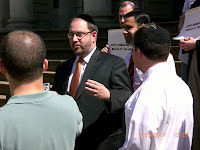 A number of rabbis involved in that initial protest then spoke, beginning with the two who came up with the idea of divestment. Rabbi Steven Burton said succinctly that "this disvestiture has the potential to change a great deal of bad behavior" — and Rabbi Etan Mintz (pictured) reiterated Councilmember Rivera's point about the immediacy of the situation, saying "right now is the time that we must act." 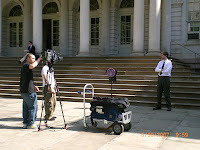 Ari Hoffnung added that "when New York City speaks, the country listens." 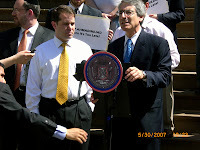 Councilmember Simcha Felder then spoke, and said that it used to bother him how New Yorkers kvetch so much, saying "oy" all the time — until Rivera pointed out to him that the identically-pronounced Spanish word hoy means 'today.' He told the citizens of NYC to be "proactive and move forward before something happens," and characterized the point of the plan to divest from Iran by saying "we will not use our money to support a murderer." 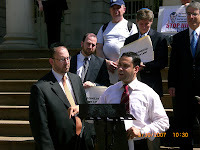 Rabbi Jason Herman then made the point that this isn't just about Iran and their nuclear development — Iran funds and supports Hizballah and other Radical Islamic terrorist organizations, and if the money trail begins with New York City and State pensions being invested in businesses that invest in Iran, then the ideology of groups like Hamas and Alqa‘ida "is being funded by these pension funds." By pulling the plug on the resources of such groups, "we can win over the hearts and minds" of the Muslim world, and "end terror all over the world." Councilmember Rivera then told the well-known, much-varied story of the Scorpion and the Frog, specifically the version in which the unfortunate victim is a Beaver. In response to questions from the press (no I didn't ask any), he said that the ultimate goal is "complete economic sanctions" against Iran and any foreign corporations that invest there. We need to make sure that we ourselves are not funding Iran's nuclear development that may very well one day be used against us. Congressional Research Services identified a dozen companies that have significant investments in Iran; more information can be found at DivestfromIran.com. 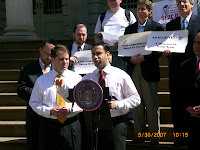 After the press conference, Rabbi Herman explained to me that the rabbis approached the councilmembers with the idea of divestment; he also praised Rivera, saying that "he took the initiative to say 'you're right'." 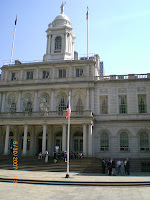 Now that this resolution is being introduced to the New York City Council, and other parts of the country are taking similar steps, he added, "I feel like my five hours in jail were productive." 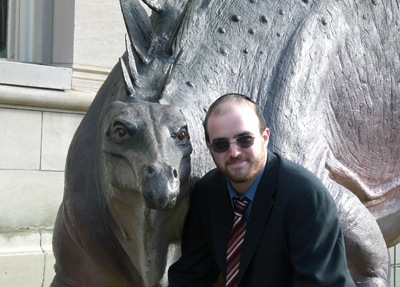 Ok, maybe there are no elephants... but are there at least sharks with lasers on their heads? Looking forward to reading what you've found out...from the best amateur freelance wannabe journalist around! Good luck Steg. Just don't get arrested yourself. Send some of those rabbis over here. We need some voices of reason - the Bay Area's wimpy peace-and-butterfly-lovin' attitude is getting on my nerves again. Yasher-Qoach for reporting! It's very very very very very important to see that there are a handful of people doing what every single rabbi/community leader -as well as our "elected" "representatives"- sould be doing! Interesting stuff. Nice demonstration of combining attention-getting tactics with practicalities, something that it's easy to lose sight of. More nasty crap on the streets of San Francisco tomorrow, in case anyone is interested. An Early Modern Midrash on Tolerance? Do I Need An Image-Adjustment?